If you can't find the variety of chillies known as "heaven facing" at your local Asian grocer, use dried small red ones instead. This dish is hot and numbing – and represents everything that is good about Sichuan food. 1. Dust the chicken pieces with the flour. Heat 100ml oil in a wok over a medium-high heat (or it tends to sweat and boil rather than fry). Shallow-fry the chicken until golden and cooked through, about 4 minutes. Drain chicken on paper towel. Discard oil and wipe out the wok. 2. Place wok back on a medium-low heat and add remaining oil. Gently fry all the chillies until fragrant, then remove from wok and set aside. Add ginger and garlic to wok and stir-fry until fragrant. 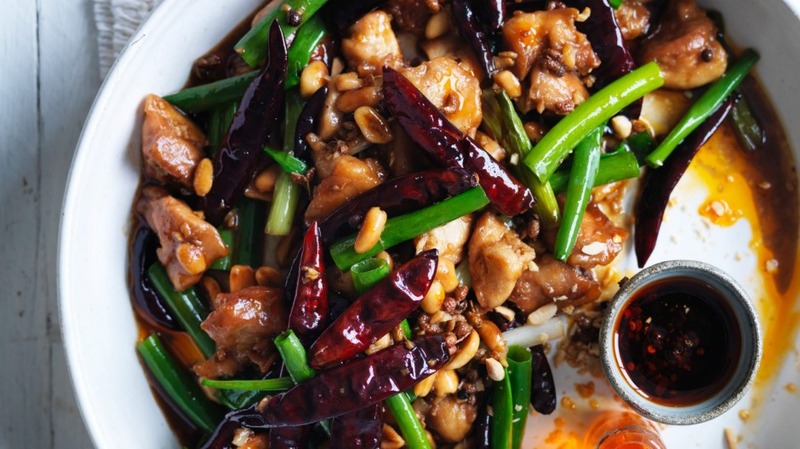 Add white sections of spring onions, Sichuan peppercorns, half the peanuts, all the reserved chicken and chillies and continue to stir-fry for a minute. Deglaze with Shaoxing, then add sugar, stock and soy, simmer for a minute or two until a sauce forms. 3. Add spring onion greens and stir to coat everything well with the sauce. Serve garnished with remaining peanuts, chilli oil and steamed rice.